Although foreign enemies never defeated USS Constitution, neglect nearly conquered her. Most shipbuilders expected their creations to last 20 years, at most. Constitution has been with us for 215. “Old Ironsides’” reputation secured her an extended life, but many times in her long career, she nearly met with an ignominious end. A similar fate nearly befell a miniature Constitution on loan to the museum. This model of the real thing has languished in storage since 1978. Before that it was on display at the Old South Meeting House in Boston since 1903. The loan records remind us that the model was commissioned by General Charles Greely Loring (1828-1902), a Civil War hero who later served as the first executive officer of the Boston Museum of Fine Arts for 26 years until his death in 1902. He asked a Constitution sailor to build him a model of the famous ship, and displayed it in his house in Pride’s Crossing (Essex, MA). Around 1878 a retired tar, a resident of Boston’s Old Sailors Home, rigged or possibly re-rigged the model. 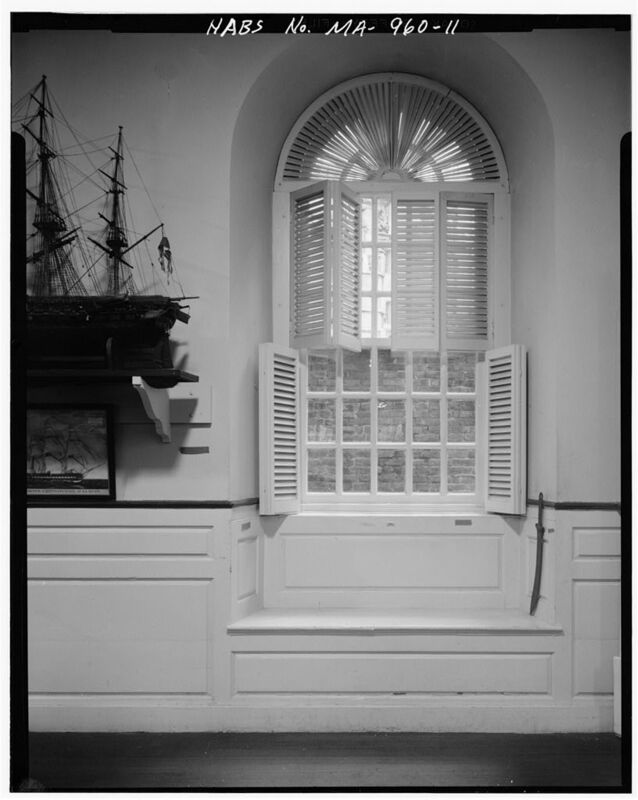 After Loring’s death, his wife contacted the Old South Meeting House and asked to put it on display there, where it remained until 1978. 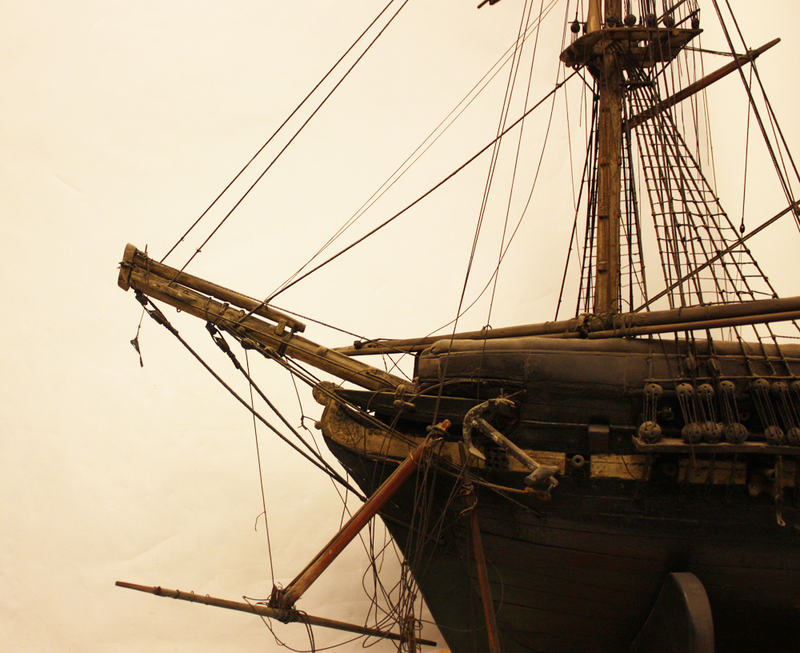 The model’s bowsprit, after a collision with children, souvenir hunters, and time. The museum subsequently placed the model on a small table made of timbers from the Old South Meeting House in a “colonial” style. This satisfied both parties but did not prevent the model from being pulled off its perch by a child in 1914. The damage was fully repaired, but that was the last anyone heard about it for more than half a century. In 1976 the Old South Meeting House changed its mission and reduced the number of artifacts on display. The Loring model found a home at the new USS Constitution Museum, opened just a few years earlier at the Charlestown Navy Yard. The transfer took place at noon on April 25, 1978, and it was received by an enthusiastic curator Mr. Robert Badmington. The grime of the ancient mariner. 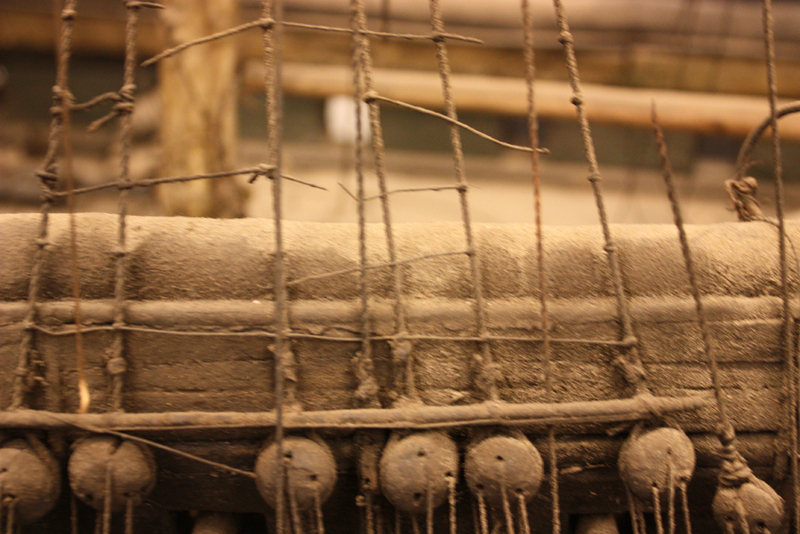 One hundred years worth of dust and soot cover the model’s decks. Although he had plans to restore the model, Mr. Badmington never got around to it. In 1992 the USS Constitution Museum asked the Loring family to donate the model to the Museum so it could be cleaned and repaired by members of the USS Constitution Model Shipwright Guild. Nothing came of this request and in 2003 the Museum again contacted the Loring family- it was time for the model to return to them: “Since it arrived here in 1978, the model has been deemed too fragile and in too much disrepair to be displayed. (…) Given its condition and its size (approximately six feet long and nearly five feet high), the USS Constitution Museum has deemed it too expensive to continue to store.” Fortuitously, there was no response and the Museum kept the model in storage. The model’s port quarter. The boats that hung in the davits vanished long ago. On February 5, 2013 the Charles Greely Loring model of USS Constitution will finally come out of storage. It will join sixty five other models in the the USS Constitution Museum’s Figgie Theater and the cleaning will begin. Every Tuesday between 11 am and 3 pm for the duration of this year’s model show, modelers will use Q-tips and a “mild enzymatic solution” and begin the painstaking task of wiping off over 100 years of grime and dust. If you visit, be sure to cheer them on! Now here’s a health to Captain Hull….